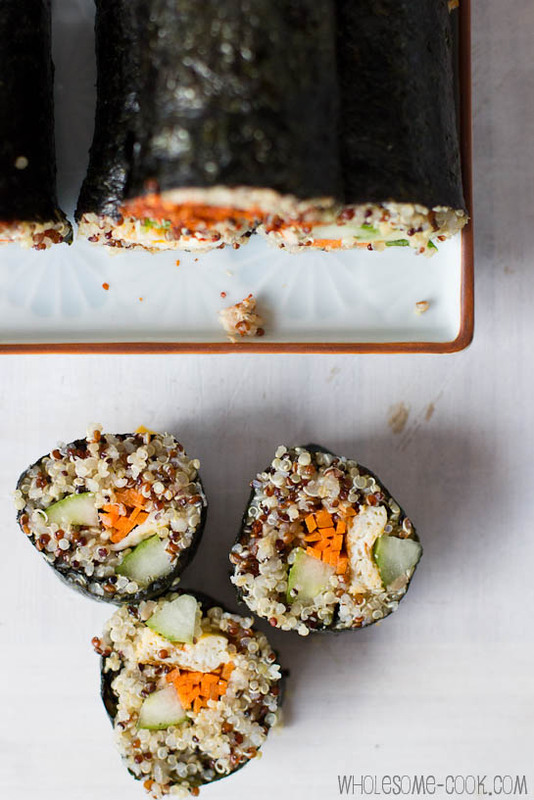 A trendy twist on tradition, these Quinoa Sushi Rolls make for a great tasty snack or even a healthy packed lunch option. Fill with your favourite sushi fillings – three of my favourite filling suggestions below. Why didn’t I think of this myself?? 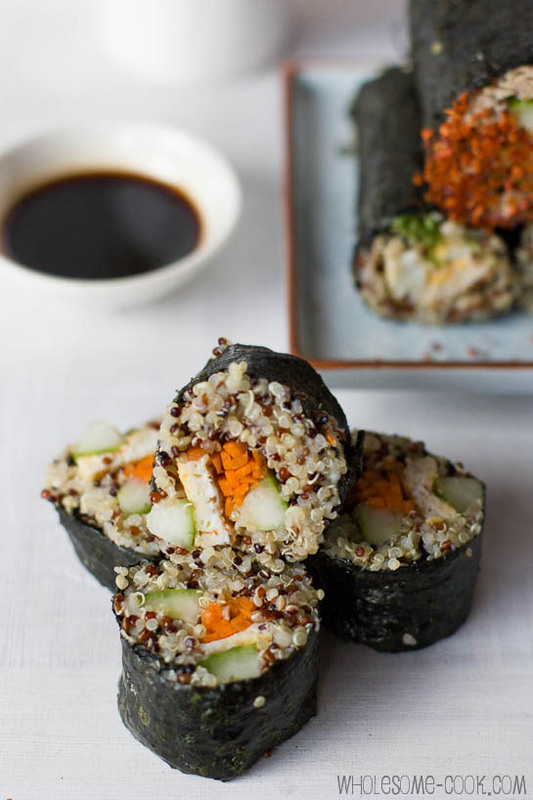 I mean this quinoa sushi would have been right up my alley. You know, inventive and quirky. Nevertheless, the credit is not mine to take. It’s Donna Hay’s actually. 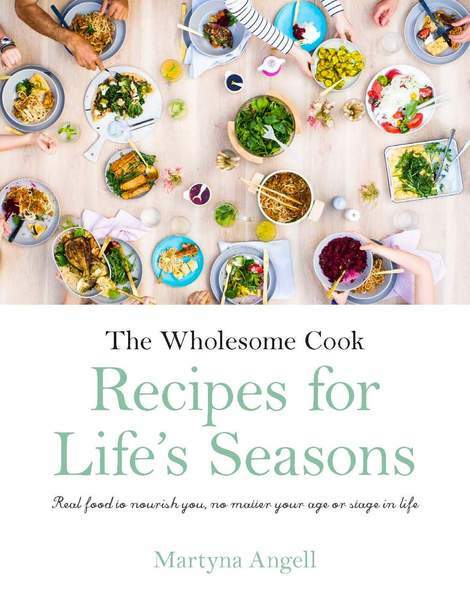 As part of the winning EDB3 photography contest prize pack I received a collection of 10 new cookbooks thanks to the generous sponsorship by Harper Collins publishers. Amongst their many fabulous titles – can’t wait to cook from Rachel Allen’s Cake and read Nigel Slater’s latest Kitchen Diaries II tome by the way, I found Donna Hay’s new Fresh and Light and got flicking. Now, Donna Hay needs little introduction. She is Australia’s queen of sophisticated yet simple style in both her recipes and food styling. Both her bi-monthly magazine and cookbooks are selling better than hot cakes. A few years back, before I even began blogging, I had the pleasure of attending an intimate dinner event for the launch of her No Time to Cook cookbook. It was a once in a lifetime opportunity to take a sneak peek at where all the action happens – Donna’s Surry Hills studio and taste kitchen. I was mesmerised by the amount of cute, vintage props and food styling paraphernalia and, of course, Donna’s simple approach to making food taste good. I was hooked and have been collecting her cookbooks ever since! Some say that since she’s not a trained chef she should not be categorized as such, but hey, if she can teach an average home cook about preparing fresh, tasty food why should we judge? Her passion and experience are just as good, in my books, as any piece of paper. And the food looks good too! 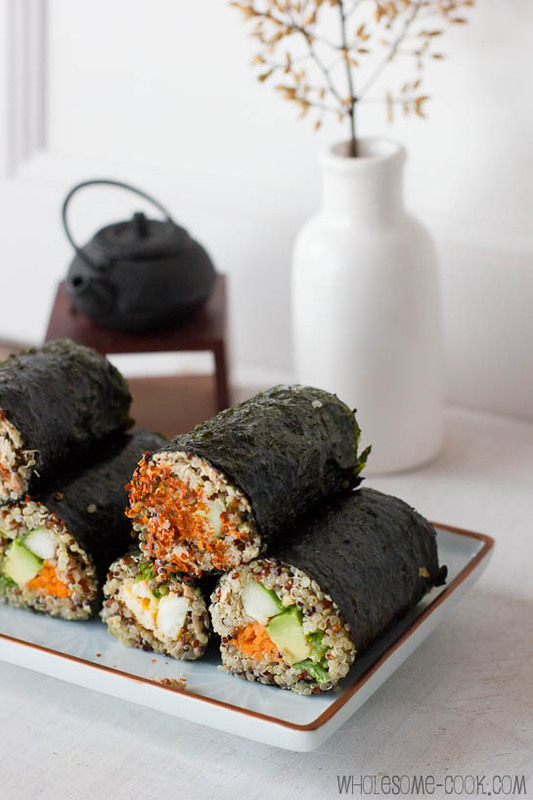 Since I’ve been wanting to introduce the kids to sushi, discovering this quinoa sushi roll recipe was the perfect opportunity to try. They loved it! The quinoa which they already adore and crunchy fresh veggies made up for the “green seaweed skin”. Perhaps I omitted the word seaweed, but nevertheless they liked it and so did I. The following recipe has been adapted from Donna Hay’s Fresh and Light cookbook. I have played with my own fillings and have omitted sugar and mirin from the quinoa base – if you don’t cook much Japanese food, mirin could be a wasteful purchase. I’ve also added some almonds and seeds to the mix! Mix together tuna, mayonaise and chilli. Reserve cucumber and avocado for assembly. Drizzle Sriracha over the omellette and cover pan with a lid. Cook for another 2 minutes or until the eggs are set. Remove from pan and cut into 1cm /0.5in strips. I made these too! Aren’t they gorgeous 🙂 Thanks for linking to my Quinoa Croquettes! Great recipe to introduce kids to one thing if they like the other.Love that first shot, very Japanese! 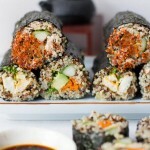 LOVE this idea – such pretty sushi rolls, a great healthy twist! Love this. Such a great alternative to rice. Thanks for linking back to my recipe as well! You are welcome John, it’s a great one! These look fantastic – what a great variation of sushi. Looks good, and so much easier than faffing with sushi rice! Very inventive indeed Donna Hay. I love the texture of quinoa and this is a prefect healthy lunch box idea! Thank you! These look so appetising on that plate. Who could resist? 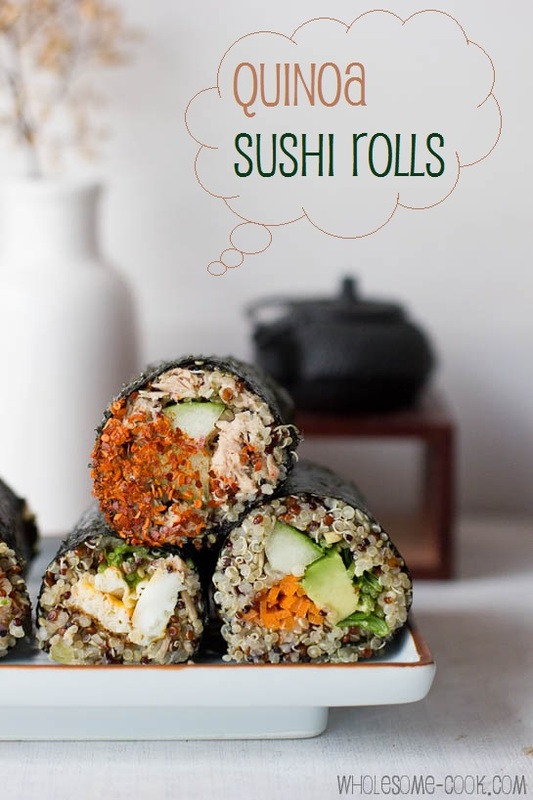 I like a lot this idea of filling sushi rolls with something else than rice (I did try once with some other grains but they didn’t stick enough and it was a tragedy…). Especially since it looks successful, beautiful and very appetising! I have seen some books by Donna Hey here (translated to French) but now I think I should look closer next time. Thanks for the recommendation. You are welcome Sissi – Donna’s food is often very simple to prepare but delicious. This is fantastic because I love sushi but I’ve come to realise it’s not as great for you as I first thought. I can’t wait to give this a go! What a clever and creative way to use quinoa! Living in Peru means we have an abundance of quinoa and I’m always looking for a new recipes that uses it. Thanks so much! My friends will be impressed. The tuna roll is probably my favourite, followed closely by the salad one. Enjoy! You really redefine a lot of stuff and thats one of the reasons I love your blog. I always expect something new like this. Thanks Raymund, it’s one of my passions although this reinvention is not quite mine to take credit for, but I did add my own twist. Loved these from the moment I saw them! We had some for lunch today – loved tuna by the way and having leftovers for lunch. Soooo tasty! Your photographs are beautiful! I love the sushi rolls, a unique twist packed full with many flavours, yum! Totally irresistible and extremely sinful. Oh my, these look amazing. Can’t wait to make them! Whats the red powder that you have used on some of the rolls? What beautiful rolls! This recipe is very original. I love the idea. You never stop amazing me. 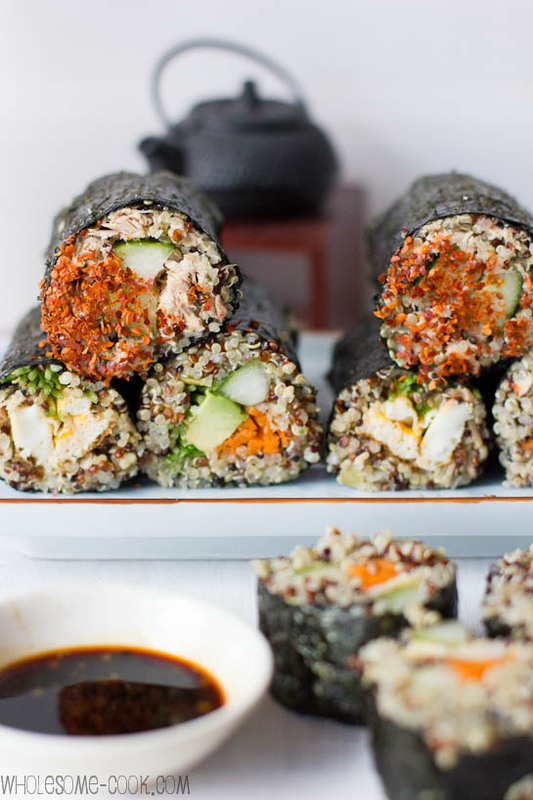 I absolutely love these quinoa sushi rolls!!!! Brilliant recipe and photography, Martyna! We’ve just finished eating these and they are sooo good. I made all 3 rolls and they feel so much lighter. thank you for the alternative! What a fantastic idea!!! I am definitely trying this… thanks to both you and Donna Hay for introducing a delicious, wholesome twist to much loved sushi rolls. Yum! What a great idea! I’ve thought of making sushi with bulgur for a long time as I don’t like rice. I love wholesome food, too. I’m glad that I’ve found your site. I will follow your blog for healthy yummy recipe ideas. Thank you! Oooh looks relay good recipe … Thank you . Yum! So great idea! I’ve thought of making sushi, since I’ve always love to eat different sushi dishes like those in So Good Sushi shop, so delicious sushi fine and varied!. I posted my how to make simple sushi post today including our recipe for super quick blender mayo and wanted to move on from there so have stumbled on your post. LOVE this idea and yes I’m thinking why didn’t I automatically step to that conclusion myself (we eat a Paleo’ish diet). Thanks for the inspiration! What a fabulous idea! Have you tried other grains? Do you have any alternatives for some healthy sushi sauces?